We’ll be starting with the WA Riesling, which we chose because it was from Columbia Valley. Previously we did a wine and cheese pairing with another pretty famous WA Riesling brand, Chateau Ste. 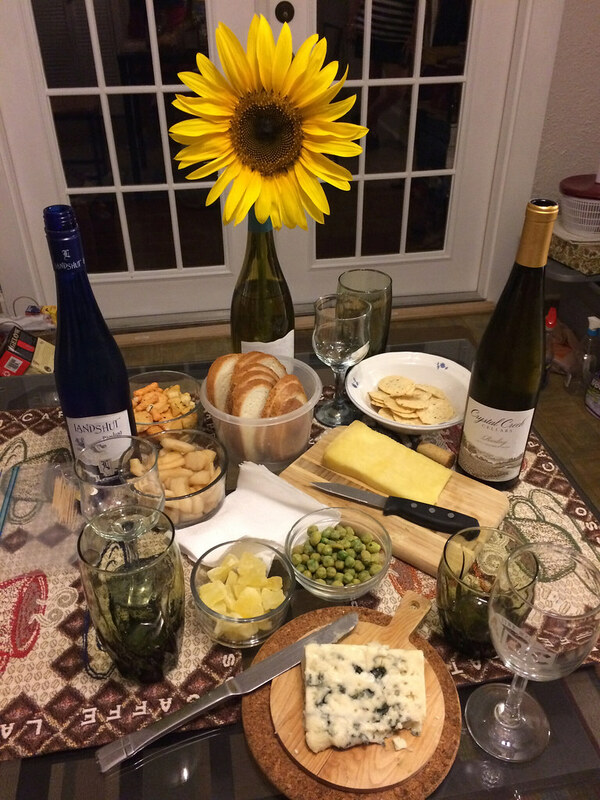 Michelle, http://wineandcheesefriday.com/riesling-and-swiss/. I was curious if this brand, Crystal Creek Cellars, https://www.aldi.us/en/grocery-home/wine-cellar/wine-awards/wine-award-detail/ps/p/crystal-creek-cellars-riesling-2/, from Aldi, would be similar at all? During our swirling of the WA wine, we found quite a variety of aromas including petroleum, mineral, slate, and that it was sweet. Val made note of the pear/apple flavor and said she’s had a fruit before that was a cross between the two. I didn’t know something like that existed. She enjoyed that there was no bite or much of an alcohol flavor. I thought it tasted like honey and then was surprised by the lemon finish. Amanda said it was smooth, fruity and easy to drink. She was interested in finding that lemon flavor, then she figured out that if she took a small sip of wine it was really tart but if she took a bigger sip it was sweet. Pretty cool, maybe I’ll have to try that with some other wines? Neil came in towards the end and said it was tangerine and butterscotch. Val and Amanda decided that they liked this wine better than the German Riesling. Neil and I very rarely drink Riesling so we were curious to see how the German Riesling might differ. This next wine, Landshut Riesling, was also from Aldi. 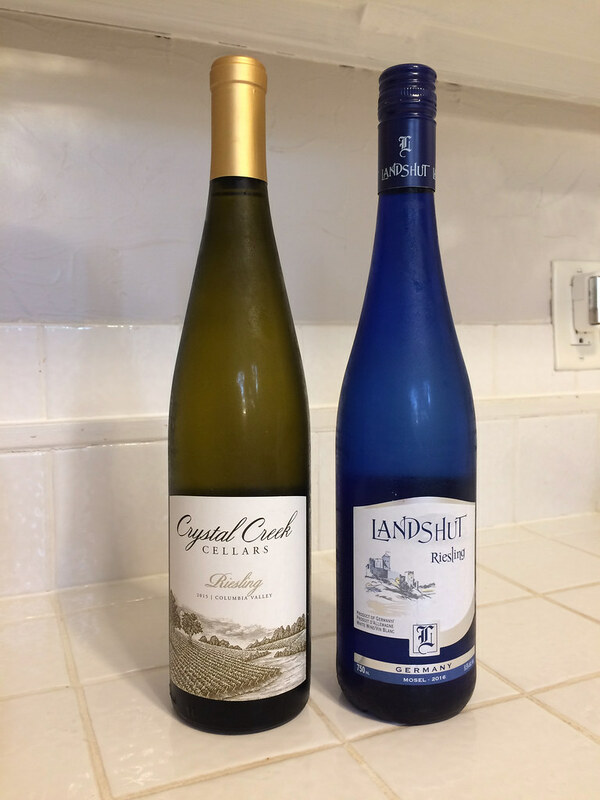 (https://www.aldi.us/en/grocery-home/wine-cellar/white-wines/white-wines-detail/ps/p/landshut-riesling/) I think I’m the only person who sniffed and swirled it to look for aromas. It smelled sugary sweet and like flowers. At first when we tasted it, Val and Amanda didn’t really like it, identifying flavors of off-brand 7-up and vinegar. I agreed that it was kind of effervescent but Neil and I found it to be clean and crisp. I didn’t think it was that sweet and although it tasted like a lifesaver, it seemed more boring than the first. Neil thought it was sweeter than the WA wine and it reminded him of a Sauvignon Blanc. After Amanda and Val’s first sips they thought there were berry flavors including black cherry and blueberry. How strange! Now on to the cheeses. Cantal cheese is a French cheese made from cow’s milk and the Roquefort cheese is another French cheese but it’s made from sheep’s milk. I’d never heard of the Cantal Cheese but since it was the Trader Joe’s featured cheese, I figured we’d give it a try. 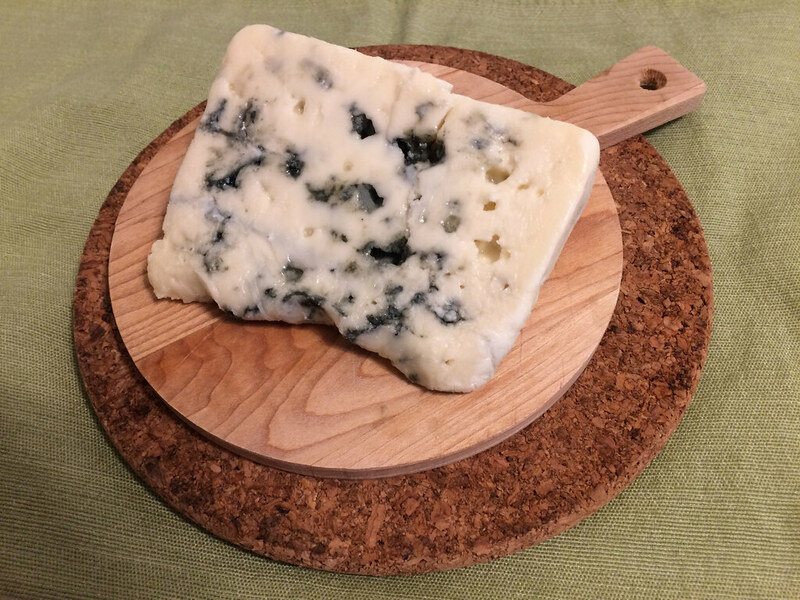 The Roquefort cheese is a blue cheese and I’ve had my eye on it for WineAndCheeseFriday for a while. It seemed like a good match for the Rieslings since funky cheeses pair nicely with sweeter wines. 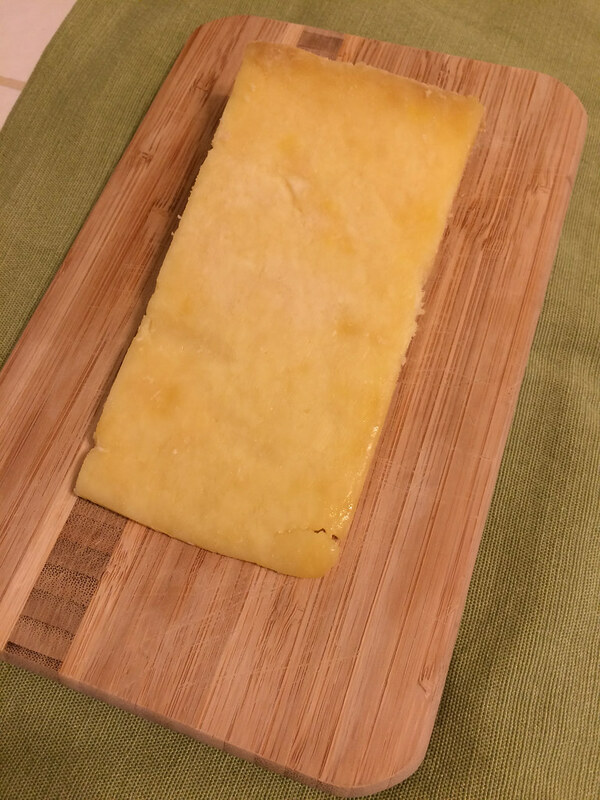 Since none of us knew the Cantal cheese we sniffed it to see if it was mild or strong? We all decided it was a pretty mild, easy to eat cheese. I could taste the flavor of milk and found it to be rich. Val and Amanda both made note of the texture of the cheese. Val found it to be hard but creamy and Amanda thought it was a medium texture that wasn’t quite creamy or crumbly. Amanda compared it to something like soft cheddar and decided this was her favorite cheese of the two. Everyone knows that blue cheeses are funky and strong so we all kind of waited until we were ready to taste the Roquefort. Val made a kind of sour face when she tasted it but said “I like it!” Neil had tried a slice of the cheese earlier that day to see how strong it would be, but during the official tasting, he said it wasn’t quite as strong as before. He also found that since it had warmed up, it was more flavorful. When I was looking for aromas, it was salty and funky, just as we’d expect. The flavor tingled my tongue and the texture was a little crunchy. I enjoyed the lingering flavor and noticed it to taste a little buttery. Amanda was the last to try it and was kind of afraid. She said it was a little stinky but it was definitely an intense experience for her. She could feel the flavors in her nose and eyes. I think that was her first and last taste of it but she was content to eat the Cantal. Neil, Val and I all preferred the extreme flavor of the Roquefort! Before we paired the wines and cheeses together we tried some of the other treats. There were crackers and bread for cleansing our palates, red pears, wasabi peas and oriental snack mix for their spiciness and dried pineapple for a hint of sweetness. Although we didn’t take notes on all of these snacks, we did for the peas and pineapple. I guess this was a big night for Amanda because she had never tried a wasabi pea before. And after finding out how spicy it really was, I’m not sure she will be having more. I thought the peas went great with the German wine and probably had like 25 of them. Val took my recommendation for the pairing and found tangerine and cherry flavors to appear in the wine. What a strange experience she was having with that wine! Neil tried the pineapple with the roquefort cheese and really liked the combination of flavors. I had remembered finding pineapple flavors in blue cheese before so I thought they would work well together. Amanda tasted her wine after eating some pineapple and thought the wine became more bitter. By the time it comes to pairing the wines and cheeses, we are usually having so much fun that we don’t get to all of them or I forget to ask for the notes. Here’s a few of our observations. Val paired both cheeses with the WA wine and thought the wine with the Cantal was okay but the flavors were too similar. She preferred the wine with the Roquefort which was both sweet and strong. Amanda only paired the WA wine with the Roquefort and thought the wine amplified the cheese flavors. What a good sport she was for putting up with all our strong flavors that night! Being the overachiever that I am, I paired all the wines and cheeses. #winenerd. When I paired the German wine with either cheese the wine became more effervescent. The Cantal cheese seemed thicker on my tongue after having the wine. The Roquefort cheese got even funkier when it was paired with the wine. The WA wine didn’t create many changes in the cheeses or vice versa. Neil and I didn’t choose a favorite wine that night but now we can say we’ve tried some more Rieslings. And I got to have my Roquefort cheese. Since this tasting was inspired by that Chateau Ste Michelle lets check that entry. Wow it seems they were very similar, pear, apple, honey and a tartness. Even the pairing seemed the same with the wine getting milder. What a fun pairing with Val, Amanda and Neil and such a great way to celebrate 100 wine and cheese pairings! *In addition to our wine and cheese pairings, we’ve gone wine tasting, cheese tasting, visited numerous wineries, played wine games, paired wine and chocolate and even tasted wine ice cream. Visit our home page (http://wineandcheesefriday.com) to see all our other entries related to wine and cheese activities!